At the very beginning of his 911 call, Zimmerman tells the operator that there have been a lot of break-ins recently. In fact, there were eight burglaries in the previous fifteen months. Where the intruders were identified, most were young black males, including two who invaded the home of a young mother and tried to break into the bedroom she had locked herself into with her infant son. This must have been a terrifying experience, but it was not of interest to the MSM. Zimmerman met with the woman afterward. Is Twin Lakes in Sanford an anomaly? Like the 911 calls, Justice Department statistics are a click or two away. Between 1976 and 2005, African-Americans, 12.6% of the population in the last census, committed 52.2% of all homicides. Actually, it is worse if you look at the criminality of the individual person. There are about 5.6 times more Whites 72.4% then Blacks 12.6% . 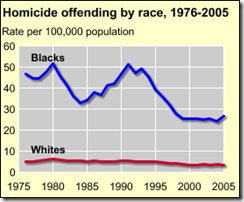 So very few blacks kill 3.7 times more whites then 5 times as many whites kill Blacks. Thus an individual Black is about 20 times as likely to kill a White then an individual White to kill a Black person. And considering that Hispanic Whites commit a larger percentage of crime then non-Hispanic whites (63.7%) the numbers get even bigger compared to non-Hispanic Whites. My math might be off. It looks like Blacks are “only” 7 times as likely to kill a White, compared to Whites killing Blacks (homicide tables). It would be interesting to find the table that separates the Hispanic and the non-Hispanic Whites. So racial profiling is totally justified. Yes, Blacks kill Blacks too, and certainly honest reputable Blacks are afraid of adolescent gang toughs and probably strive to avoid and fear a group of Blacks more then a group of Whites. In spite of alleged racism that would make Blacks fear Whites. Police were called, the justice secretary office of the state of São Paulo opened an inquiry into the crime of racism against a stand up comedian. 1 One owner of the nightclub was arrested and released on bail. The night club might get closed down. Sanitary authorities were called and the night club’s kitchen was closed. An alien kitchen worker was sent home to get his documentation. The crime? 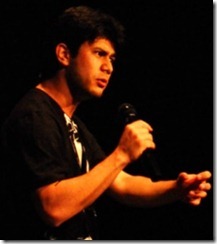 Black comedian Felipe Hamachi had called a black musician "monkey". At a comedy show where all guests had signed a waiver, that they are aware that they can be the target of offensive humor and jokes. The musician was not a paying guest and had not signed the waiver. Rather he worked in the show, but had mingled with the paying public. Legal officials stated that the waiver was legally invalid, as nobody can sign away their human rights. A comedian that can not make jukes without offending a large portion of the population should change his profession. All humor has a "victim". Prohibiting jokes about blacks while those about Portuguese, blondes, Japanese and several other groups are allowed, it is more racist than the offensive joke itself.